So what is an immersion circulator? An immersion circulator is a piece of hardware that you immerse in to a (heat proof) container filled with water. 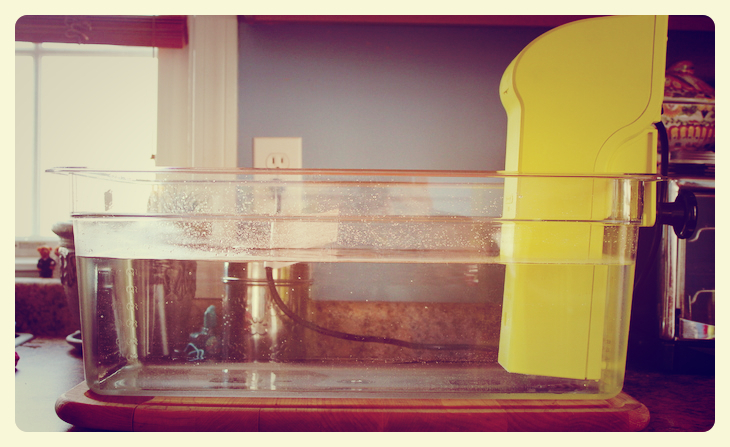 They allow you to heat the water to a precise temperature and keep it at that temperature for extended periods of time. Why is this helpful? Well, when you can guarantee a precise temperature, you can be sure that any food cooked in the water bath will be cooked to that temperature and no further, saving you from worry of overcooking. As an example: If you have your water bath set to be 130º and whatever you’re cooking has reached an internal temperature of 130º, there’s no way it can end up cooking beyond that point. Its the ultimate “set-it-and-forget-it” kitchen gadget! Most units have 3 things of note: a heating element, a propulsion mechanism that pushes heated water out of the unit, and a display to monitor current temperature and set your target temperature. 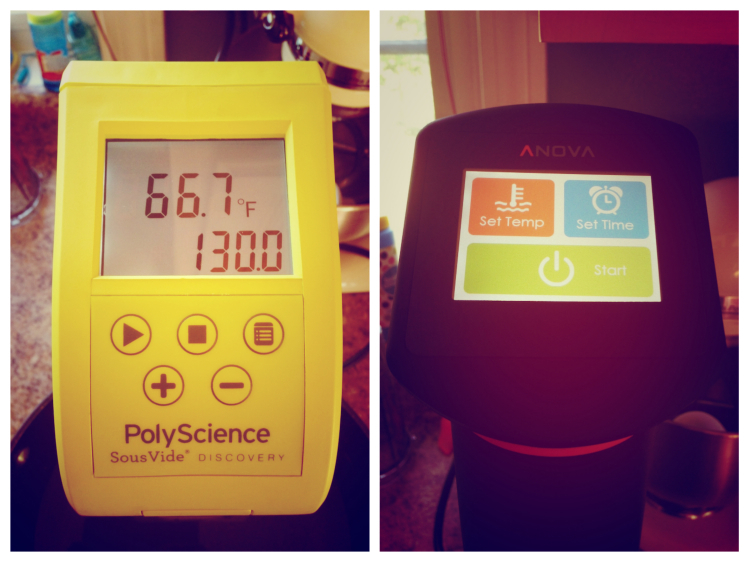 Displays of the PolyScience Discovery (left) and the Anova Precision Cooker One (right). That’s the first question people ask whenever I talk about immersion circulators, and its an understandable question to ask. The most simple answer to give is, “A’yup.” You do, in fact, cook things in the water, but you seal ingredients you’re cooking inside a container of some kind, with the typical selection being a plastic ziplock bag. Most professional kitchens utilize vacuum sealers on the items they plan to cook, which is where the term “sous vide” comes from (sous vide is French for “under vacuum”). For most things you’ll cook at home, proteins like steak or salmon or vegetables like carrots or asparagus, you can just use the principle of water displacement (see it discussed on ChefStes) to get most of the air out of a ziplock bag. Which immersion circulator should I get? It really comes down to preference and price point. 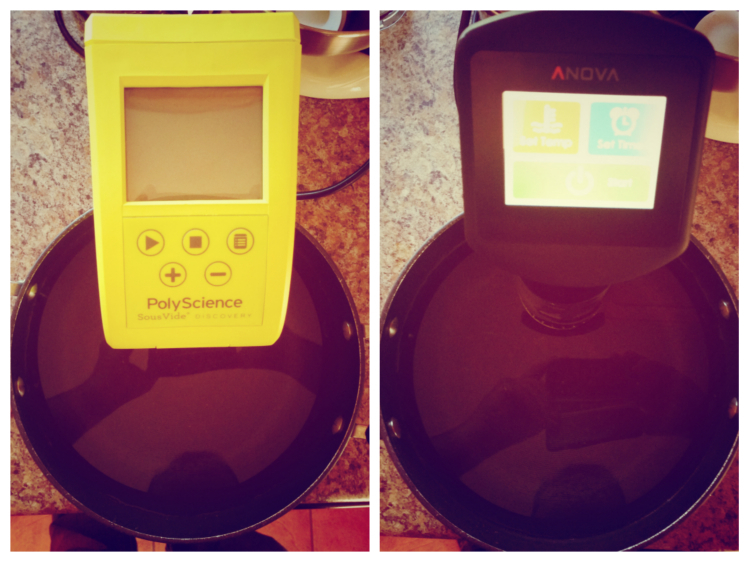 I have had the opportunity to test out both the PolyScience Discovery Circulator and the Anova Precision Cooker One. Both have similar specifications. The Discovery has been pin-point accurate in terms of temperature, showing the exact same temperature on an external thermometer (the Anova tended to go .5º over what was displayed on the unit). The Anova has a stronger pump (a 12 Liter pump compared to the PolyScience which boasts a 6 Liter pump) which does lead to quicker heating. And, if you’re tight on space, the Anova takes up a bit less space both in terms of storage and in your cooking vessel. “Footprint” difference using the same pot. In terms of pricing, the PolyScience Discovery is at the higher end ($299). With that obviously comes brand confidence, as you’re utilizing hardware produced by the same company that provides professional units to the best kitchens in the world. Their documentation is well beyond what accompanied the Anova unit (which was surprisingly riddled with all sorts of grammatical errors). In terms of functionality, however, it is a very tight race between the Discovery and the Anova Precision Cooker One ($199), and likely the same goes for the other circulators I didn’t have the opportunity to test (for a full comparison of the other players, check out Kenji’s article over on seriouseats.com). Bottom line: There are a lot of solid options to choose from, which is great for the consumer. Take some time to do some additional reading on sous vide techniques and recipes, and check out the free ChefSteps course on sous vide cooking to get a feel for what’s involved, then get yourself an immersion circulator. You won’t regret it!